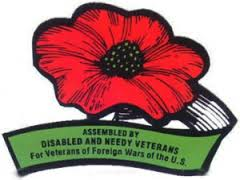 Members of the Post and Auxiliary are needed to assist in the distribution of Buddy Poppies. This is one of the two major events of the year that raise money for the Service Funds — the source of support for direct help to veterans and family members, and also to our active duty members. Please use the contact procedure below to volunteer for a few hours over the MEMORIAL DAY weekend to help with this activity. Let the Chairman know what days and hours you can be available and include your telephone number so you can be contacted to confirm the time and location.